For diluting alcohol dissolved KREIDEZEIT products such as Shellac Sealing Primer. For cleaning tools that have been soiled with these products. For stain removal and degreasing of surfaces. For fungi removal. For dissolving alcohol-soluble natural resins such as shellac and copal. 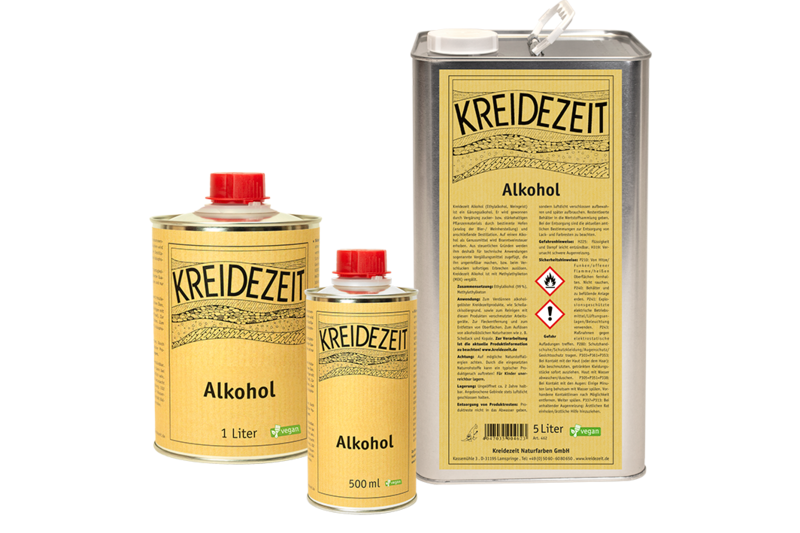 KREIDEZEIT Alcohol (ethyl alcohol, spirit) is a fermentation alcohol. It is obtained by fermenting plant material containing sugar or starch through certain yeasts (analogous to beer/ wine production) and subsequent distillation. Distillation tax is levied on pure alcohol as a beverage. For tax reasons, so-called denaturants are therefore added to it for technical applications, which make it inedible or cause immediate vomiting if swallowed. KREIDEZEIT Alcohol is denatured with methyl ethyl ketone (MEK).